Looking for a source for engraved items with a wide selection of products, styles, and aesthetics? Frederick Engraving is the perfect choice to cover all your needs for personalized goods. This business has grown rapidly from its founding in 2012 in a small home office to a thriving online marketplace because, simply put, we know how to provide the most individualized, skillful, and varied engraved wares for countless occasions. Each unique engraved sentiment is laser-cut into the material with precision and care. We carry many styles of jewelry, from funky acrylic nameplate or letter necklaces to classic monogram charms for necklaces and earrings in gold and silver, and we also offer a wide selection of personalized cufflinks. Our stock of monogrammed items doesn’t stop there -- we have personalized picture frames, a huge offering of customizable glassware and drinkware, and quality bamboo cutting boards. For the sports enthusiast in your life, we carry engraved and monogrammed golf balls, and for the furry friends in your life, we have a wide assortment of colorful and fun pet name tags. It’s no wonder so many choose to come to us for engraved items! Our products are of the finest quality and meant to last as long as the memories do, and our turnaround and shipping times are among the fastest in the industry. The gift of engraved items can be just the personal touch you’re looking for in a gift for a special occasion. You might choose to customize a set of beer glasses to hand out as favors for a special Super Bowl party, or commemorate a graduation with a pair of smart monogrammed cufflinks in your graduate’s school colors featuring their name and the date. 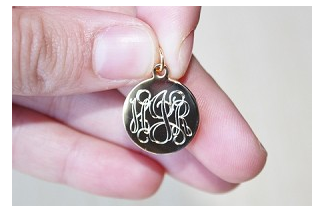 For more traditional, chic monogrammed items, you can search our selection of gold and silver necklace charms, or find a piece of acrylic stencil jewelry to dazzle a fashionista you adore. We even carry customizable glass and wood Christmas tree ornaments to hang on the family tree and remember holidays past. For beautifully crafted custom items, Frederick Engraving is the place to shop. With us, you’ll find quality, an artistic eye, and prices that can’t be beat, and we’ll help make your event or occasion a truly memorable one. Shop For Engraved Items Now !